At right: Part of the first image taken by NASA's Hubble Space Telescope on May 20, 1990. At left: A picture of the same region of sky captured by a 100-inch telescope at Las Campanas Observatory in Chile. NASA's Hubble Space Telescope may have launched 25 years ago last month, but today (May 20) marks another big anniversary for the famous observatory — a quarter-century since it took its first photo. The Hubble Space Telescope blasted off aboard the space shuttle Discovery on April 24, 1990 and was deployed a day later. 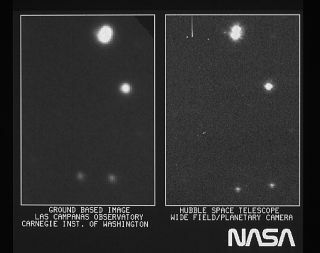 After a nearly monthlong checkout process, the observatory opened its eyes for the first time, capturing an image of several stars with its Wide Field/Planetary Camera on May 20, 1990. "The first image taken with the HST is intended to assist in focusing the telescope," representatives of the Space Telescope Science Institute (STScI) in Baltimore, which manages Hubble's science operations, wrote in a description of the image. The Hubble photo is at right in the above composite image, while on the left is a picture of the same region of sky captured by the 100-inch telescope at Las Campanas Observatory in Chile. "The region observed is centered on the 8.2 magnitude star HD96755 in the open cluster NGC 3532, in the southern constellation Carina," STScI representatives added in the image description. "Identical small subsections of the HST and ground-based image pictures were chosen to highlight the difference in resolution." Hubble's photo is considerably sharper than the ground-based image, but it's not as sharp as it should have been. Mission scientists soon discovered that the telescope launched with a flaw in its 7.9-foot-wide (2.4 meters) primary mirror — a serious problem that would make some of Hubble's planned investigations impossible to carry out. But this story has a happy ending, as everyone knows: Spacewalking astronauts fixed the problem in 1993, giving Hubble the supersharp vision it's known for today. Four additional servicing missions, which were carried out between 1997 and 2009, further repaired and upgraded Hubble, which is still returning breathtaking views of the heavens — and helping astronomers solve cosmic mysteries — to this day. Mission team members are confident the observatory will remain operational through at least 2020, and perhaps even for a number of years after that.